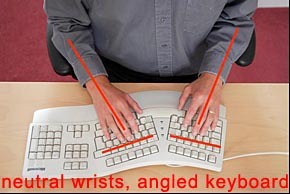 A very common bad ergonomic practice is wrist deviation when using a keyboard. Keyboards have never been the most ergonomically designed devices, and users tend to hold their wrists very central to the keyboard whilst inducing a lateral deviation in their wrist angle. Lateral (ulnar) deviation can eventually lead to wrist pain, both centrally and at the outer edges of the wrist. This can occur due to nerve pinching and tendon compression which can ultimately lead to RSI like conditions. The image on the left shows lateral deviation in both wrists. 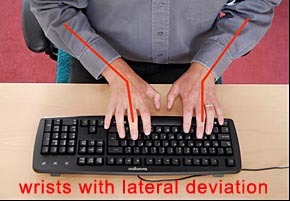 This deviation can be further worsened by the user reaching for keys at the more extreme end of the keyboard, most commonly by little lateral wrist ‘flicks’. users don’t start paying attention to wrist deviation this until pain develops. Keyboard position can become critical too. 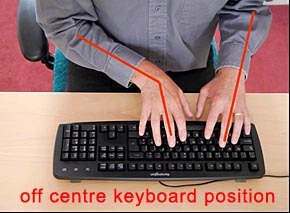 An off-centre keyboard can cause one wrist to laterally deviate more than the other. Keyboards should have the centre of the spacebar (as opposed to the centre of the keyboard) aligned to the user’s centre. This will push the numberpad (if you have one) way out to the right, but will reduce the lateral wrist deviation. Alternatively keyboards with removed numberpads (which are not always used) are available. 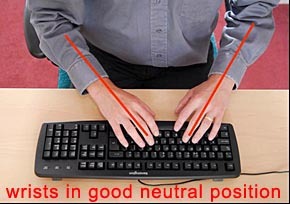 It is very important to have your wrists in a neutral position when using a keyboard. Compare the wrist deviation angle in the image to the left. The wrists are held in a neutrally straight angle. This is the best angle to hold them in to minimise potential injuries. This may feel a little strange at first, but keyboard users can get used to this style of typing posture. The hands should be lifted by the forearms and shoulders and no pivoted by the wrists. Keep in mind at all times to avoid clawed hands. Alternatively, there are a wide array of ergonomic ‘natural’ type keyboards, which present the keyboard to the user at the optimal wrist angle. Some, like the GoldTouch keyboard (pictured below) have a fully adjustable split that can be adapted to the user’s posture. Thanks for this, the explanation of lateral deviation is very, very helpful!